The cerebellum (L. cerebellum = little brain) is the 2nd largest part of the brain as a whole and is the largest part of the hindbrain. It weighs about 150 grams. Its location is in the posterior cranial fossa underneath the tentorium cerebelli and behind the pons and medulla oblongata. 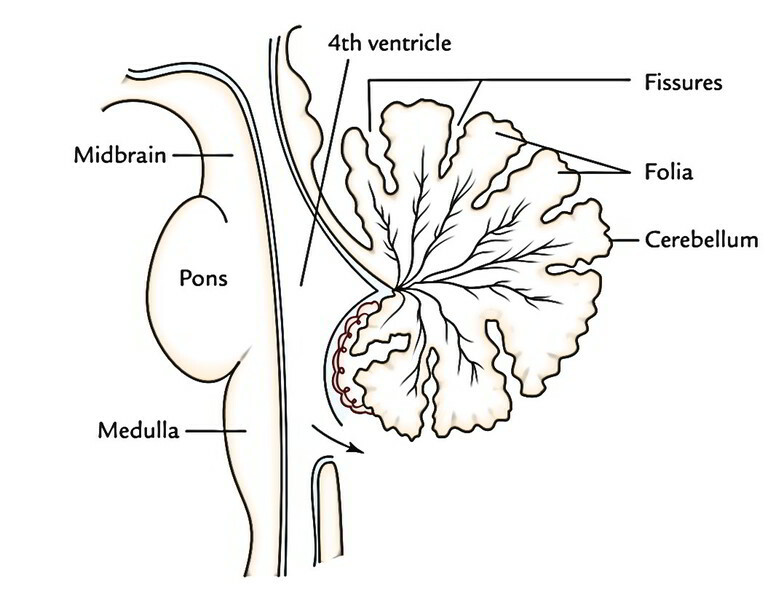 The cavity of the 4th ventricle divides the cerbellum from the pons and medulla. Numerous fine slit-like sulci named fissures create dents on its surface. Between the fissures parallel folds termed folia are located. The fissures and folia of the cerebellum are located transversely from side to side across the entire area of the cerebellum, generally. The cerebellum is composed of 2 hemispheres connected in the midline by the vermis. Every hemisphere of the cerebellum is joined to 3 parts of the brainstem by 3 pairs of the large fibre tracts named cerebellar peduncles. Coordination of somatic motor actions. The cerebellar disease is shown by motor disruptions, consisting of inability to stand erect, staggering pace, hypotonia and failure of coordination. The external features of the cerebellum constitute 3 parts: 2 surfaces, 2 notches and 3 well marked fissures. The cerebellum includes 3 parts: 2 large lateral hemispherical lobes, the cerebellar hemispheres and a narrowmedian worm like portion, referred to as vermis. The superior and inferior aspects of vermis are called superior and inferior vermis, respectively. The ridge-like superior vermis is constant on either side together with the superior surface of cerebellar hemisphere imperceptively. The inferior vermis is more clearly demarcated from the hemispheres in the floor of vallecula cerebelli. The superior outermost layer of the cerebellum is convex. The 2 cerebellar hemispheres are constant with every other on this particular surface. The inferior surface presents a deep median notch named vallecula which divides the 2 cerebellar hemispheres. The floor of the vallecula is composed by the inferior vermis and is restricted on every side by sulcus valleculae. 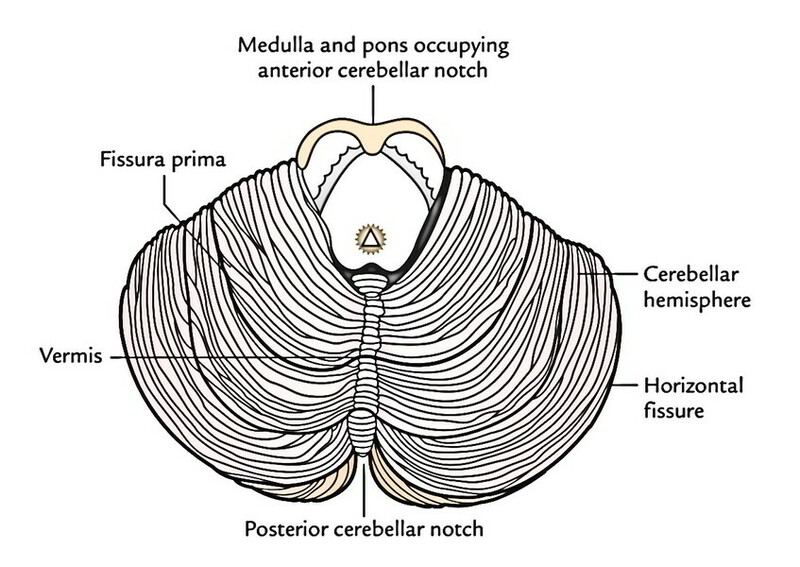 The anterior aspect of cerebellum is marked by a wide shallow anterior cerebellar notch which adapts pons and medulla. The posterior cerebellar notch is deep and narrow and lodges the falx cerebelli. The horizontal fissure is the most noticeable and runs along the lateral and posterior margins of the cerebellum. It indicates the junction between the superior and inferior surfaces of the cerebellum. 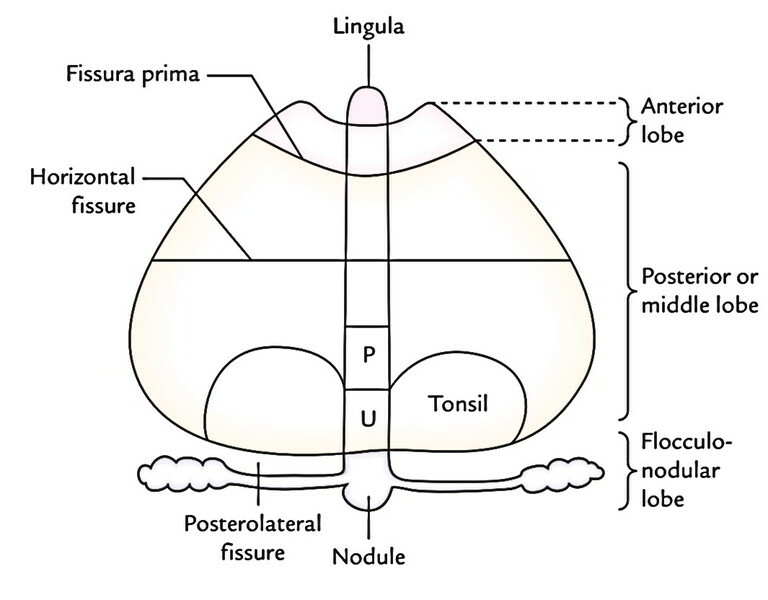 The posterolateral fissure is located on the inferior outermost layer of the cerebellum and divides the flocculonodular lobe from the remainder of the cerebellum (corpus cerebelli). The V shaped fissura prima on the superior surface cuts the superior vermis at the junction of its anterior two-third and posterior one-third. It breaks up the corpus cerebelli into anterior and posterior (middle) lobes. There are several other fissures which subdivide the vermis and cerebellar hemispheres into lobules and given fanciful names. The majority of them are overlooked to reduce the complexity of the cerebellum and only those which have a functional or illustrative value are given. Anterior lobe: It is located on the superior surface anterior to the fissura prima. Posterior/middle lobe: It is located between the fissura prima on the superior surface and posterolateral fissure on the inferior surface. Flocculonodular lobe: It’s the smallest of all and is located on the inferior surface in front of the posterolateral fissure. Archicerebellum (Vestibular cerebellum): Phylogenetically, it’s the earliest part of the cerebellum. It is composed of flocculo-nodular lobe and lingula.The archicerebellum is mainly vestibular in links and concerned with the maintenance of equilibrium, tone and bearing of trunk muscles. Paleocerebellum (Spinal cerebellum): Phylogenetically, it’s the next part of the cerebellum to appear. It contains anterior lobe (with the exception of lingula) and pyramid and the uvula of inferior vermis.The paleocerebellum is primarily spinocerebellar in links and is concerned with the tone, stance and primitive movements of the limbs. 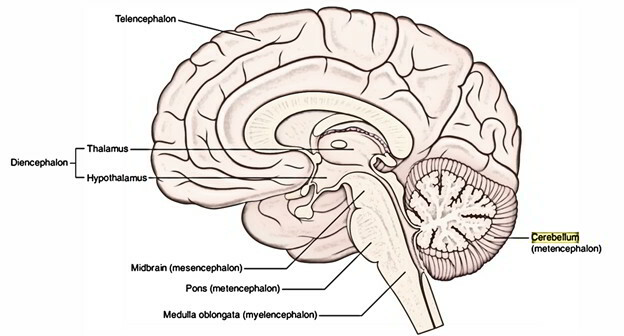 Neocerebellum (Cerebral cerebellum): Phylogenetically, it’s the latest part of the cerebellum to grow. It’s created from middle lobe, the largest part of the cerebellum (with the exception of the pyramid and the uvula of inferior vermis).The neocerebellum is predominantly corticopontocerebellar in links and is concerned with the smooth performance of proficient voluntary movements. The cerebellum is created from a thin surface layer of grey matter, the cerebellar cortex and a central core of white matter. Embedded inside the central core of white matter are masses of grey matter referred to as intracerebellar nuclei. The cerebellar cortex is folded in this manner the surface of cerebellum that presents a series of parallel transverse fissures and interceding narrow leaf like groups named folia. Every folium is composed of a slim branched lamina of central core of white matter covered by a thin layer of grey matter. The central core of white matter being ordered in the creation of branching pattern of a tree is referred to as arbor vitae cerebelli (arbor vitae = tree of life). It primarily is composed of numer-ous dendritic arborizations of Purkinje cells and comparatively few nerve cells that are widely spaced. The nerve cells are of 2 types: (a) the basket cells and (b) the stellate cells. It is composed of a single row of large flask-shaped cells, the Purkinje cells. The outgoing Purkinje axons make up the only result from the cerebellar cortex and apply an inhibitory influence on the intracerebellar nuclei. The inner granular layer contains numerous closely packed small granule cells. This layer also includes few large Golgi cells. There are 5 types of intrinsic neurons in the cerebellar cortex, viz. All the intrinsic neurons of cerebellar cortex are inhibitory with the exception of granule cells. Such a collection of inhibitory neurons isn’t seen anyplace else in the central nervous system with the exception of in the cerebellum. The intracerebellar nuclei (also referred to as central nuclei) are masses of grey matter embedded in the white matter of the cerebellum. On every side of the midline they’re 4 in number. From lateral to medial side, these are: dentate nucleus, emboliform nucleus, globose nucleus and fastigial nucleus. The dentate nucleus is the most notable of the intracerebellar nuclei and largest in primates, notably in humans. It’s the nucleus of neocerebellum and so gets afferent fibres from it. The emboliform nucleus is oval in shape and situated medial to the dentate nucleus, partly covering its hilum. It’s the nucleus of paleocerebellum, consequently gets afferent fibres from it. 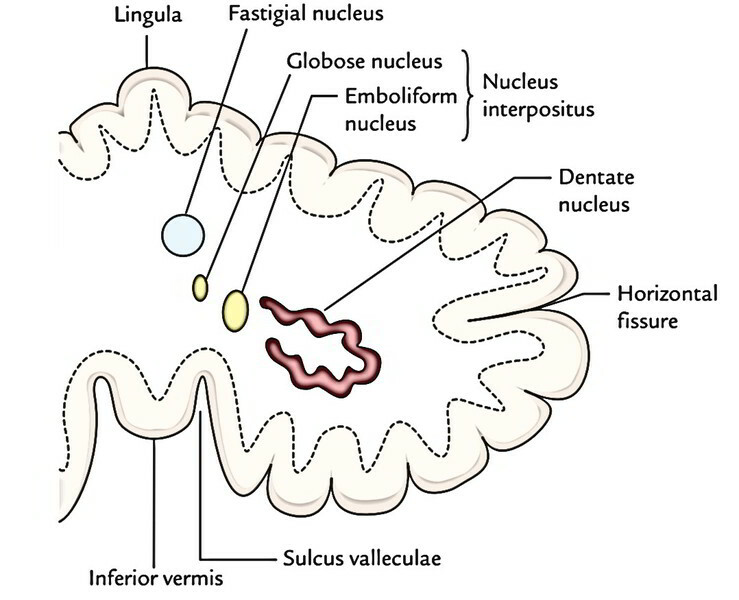 The globose nucleus is rounded in shape and is located between the emboliform and fastigial nuclei. It’s quite similar links to that of the emboliform nucleus. The globose and emboliform nuclei collectively are sometimes called nucleus interpositus. The fastigial nucleus is located near the midline in the vermis and close to the roof of the 4th ventricle is the nucleus of archicerebellum, consequently gets afferent fibres from the flocculonodular lobe (archicerebellum). The afferent and efferent fibres of the cerebellum are grouped together on every side into 3 large bundles named cerebellar peduncles. The superior cerebellar peduncles attach the cerebellum to the midbrain, the middle cerebellar peduncles to the pons and the inferior cerebellar peduncles to the medulla oblongata. 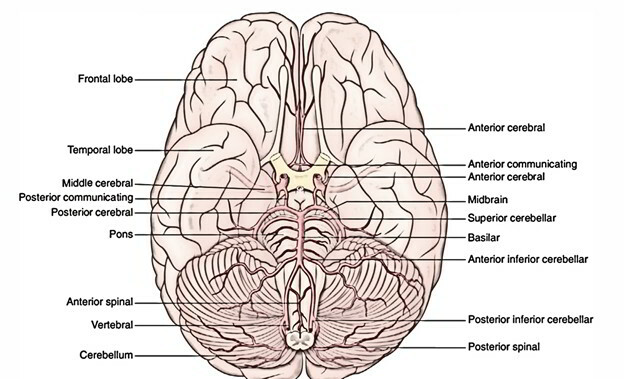 The inferior cerebellar peduncle is composed on the posterolateral aspect of the upper half of the medulla oblongata. It is composed of a large number of afferent and efferent fibres. The inferior cerebellar peduncle consists primarily of afferent fibres to the cerebellum from the spinal cord, the olivary nuclei, the reticular formation of the medulla and the vestibular nuclei and nerve. It also carries a couple of efferent fibres from the cerebellum to the medulla, mainly to the vestibular nuclei and reticular formation. The middle cerebellar peduncle is the largest of the 3 peduncles. It’s created at the posterolateral margin of the pons. The middle cerebellar peduncle comprises only afferent fibres which originate from the pontine nuclei of the opposite side. The superior cerebellar peduncle comes from the anterior cerebellar notch and creates the lateral boundary of the upper half of the 4th ventricle. It primarily includes efferent fibres going from the dentate nucleus to the red nucleus, thalamus and cerebral cortex of the opposite side. It’s the main efferent pathway from the cerebellum and its fibres originate primarily in the dentate nucleus. Anterior inferior cerebellar artery: a branch of basilar artery supplies the anterior part of the inferior outermost layer of the cerebellum. Posterior inferior cerebellar artery: a branch of vertebral artery supplies the posterior part of the inferior outermost layer of the cerebellum. Generalized muscular hypotonia, resulting in staggering pace (i.e., the patient walks with legs well apart) and ataxia (i.e., inability to keep balance while walking). Aim tremors at the ending of a voluntary action and disappear with rest. Adiadochokinesis, i.e., inability to perform quickly switching opposite movements, example, pronation and supination. Dysarthria or scanning language, i.e., speech is slurred, monotonous with pauses at inappropriate areas. Nystagmus, i.e., involuntary ‘to and fro’ oscillatory movements of the eyeballs while looking to either side because of faulty postural fixation of the conjugate gaze. Rocking toward the side of lesion on walking. Falling on the side of lesion on shutting the eyes (Romberg’s hint).